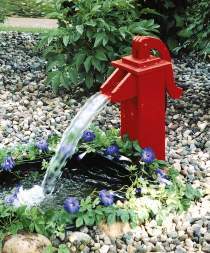 Make a replica of an old-fashioned pump and place it next to a wood barrel or garden pond. Hidden submersible recirculating pump keeps water pouring out of pump and back into the barrel or pond. All patterns drawn full size. Measures 26"H. Order plan only or see *Special offer below.